I've got a "photo Friday" tip for you this week to help your pictures come out true to the original: set your white balance. Setting the white balance is just a tool for getting your pictures to look like you want them to look. There really is no right or wrong, except for what looks good to you. Almost all digital cameras have some setting for white balance and in most cases the "auto" (AWB) mode will do a decent job. But when you take a picture under less than ideal lighting conditions, the color usually will not be true to life with AWB. Here's a demonstration that shows how the white balance setting changes the color of a picture. This picture was taken with 5500K fluorescent lights and a light tan fabric background. The modes in the first column: AWB, Daylight, Shade, Cloudy, Tungsten. The second column modes: Fluorescent, Flash, Custom, Kelvin. The AWB mode does a decent job, but the most faithful reproduction of color is the Kelvin mode, since I have it set to match the 5500K output of my lights. If you can control the light, setting your camera to the light color will usually give you the best results. But often you aren't controlling the light. For example, if you are taking a picture of a model outside in the shade, you might find that your model looks too "blue". In this case you can use the key above to pick one of the mode "yellow" modes: Shade, Flash, Cloudy. 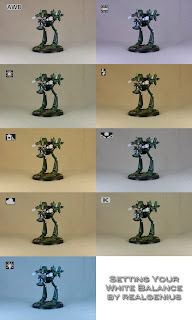 If you are inside taking a picture of a model on your desk with only a single lamp, your model may look too "yellow". In this case try Tungsten or Fluorescent modes. If you want to get advanced, you can use the Custom mode on your camera. For the image above I set the Custom white balance based on the tan fabric with no model. As you can see the tan hue of the fabric was removed (turned almost grey) and the model is given a darker almost bluish cast. By setting the custom WB to an image with a strong color, you can get some interesting effects in your photos; like "fake night" explained in this white balance article. You can find some good tips on setting and trouble-shooting your white balance in this article. What photography tips do you have for getting great photos of your models? Indirect, diffused light. Used from multiple angles to reduce shadows. From fancy studio diffuser/reflector rigs, down to the old tried and true home made setups, indirect diffused light (coupled with proper white balance) usually leads to superior pictures. Good home made diffused light? Old (clean) clear tupperware containers work in a pinch to diffuse light from an incandescent bulb. Be careful not to use it with too high a wattage however, so you don't melt any plastic accidentally. Also, one can make a cheap, effective light box with an old cardboard box, some tape, and white tissue paper. I myself built one for pennies and it works like a charm. Tutorials for home made light boxes are all over the net, have a go! If Gork had wanted you to live, he would not have created me. Excellent quick tip... the comparison shot is fantastic for actually understanding what each setting does. Someday I'll whip up a proper lighting solution for my stuff. Oi! Another great article! I have been suffering from this, now I have an idea of how to get those settings to work for me. I even built a lightbox, have diffuse lighting from several sources...and still my pictures just don't come out anywhere as good as what my models look like. "Orkses never lost a battle. If we win we win, if we die we die fighting so it don't count. If we runs for it we don't die neither, cos we can come back for annuver go, see!" Building a DIY Photobox on the Cheap. Indirect light can be created on the fly by holding a mirror or even a piece of white card at a 45-degree angle in front of the flash on your compact camera. Aim the mirror/card so that the light from the flash is reflected towards the ceiling. Most ceilings are a matte white with a broken structure, wich will give a decent amout of light reflected evenly over your minis. You might have to experiment some with whitebalance, shuttertimes and such to make it perfect. And remember: Don't do this in your pimpy bedroom with mirrors in the ceiling. Bonus: This even works while taking pics of humans! With some practice you can hold the mirror/card with two fingers even while drunk and get the best looking party pictures.